My boys swim competitively. It wasn’t originally part of our “athletic” plan for the boys – one who is now 6 and one who is now 10. The summer swim team transitioned to the winter swim team. And thankfully there isn’t too much overlap with their spring and fall baseball seasons. From the end of May to the beginning of August, I now cart them to swim practices during the day – up to five times a week. From the end of September through the beginning of March, my husband and I cart them to evening practices – up to four times a week. Sometimes their practices are on the same night. Sometimes their practices are on different nights. Since we can’t be on the pool deck during swim practices, I take the time to work out myself or work on personal or freelance projects. In the summer, we spend Monday nights in June and July at swim meets. In the winter, we spend Saturdays in December and January at swim meets. Sometimes we enter into swim invitationals on Sundays. And of course we have championship meets in August, February and March. We watch times cut by seconds. We watch qualifying times being made my less than a second – 0.01 to be exact. We watch qualifying times being missed by lesson than a second – 0.28 to be exact. We mark up arms with Sharpies: event numbers, lane numbers, heat numbers. Some kids actually get accused of cheating the next day at school because of all the leftover swim info on their arms. I’m so proud of my boys. The lessons they have learned. – both life ones and swim ones. The friendships they have made. The respect they show to their coaches. The laughter they share with the coaches. And through it all, my boys have taught me so much! Today, I post this early in the morning simply because an early alarm clock will ring. My 10-year-old will walk onto the pool deck for his championship meet. The meet where he has made the times to earn the privilege to be on that pool deck to swim the freestyle, backstroke, and butterfly strokes. We won’t find out about any potential relay events until we are on the pool deck. At this meet, we will loudly cheer for him. At this meet, I will probably hold back a few tears. I ran drove to two banks. I ran drove to the post office. I ran drove to the outlets to shop and drop off our international student. I ran drove to Costco. I visited with friends who stopped at our house. I double checked one son’s luggage as he goes with our friends for the rest of the weekend. I ran drove back to the outlets to pick up our international student. I ran drove to the gas station. I double checked the other son’s swim bag for a championship meet tomorrow. I made dinner – spaghetti – his good luck meal the night before meets. I sighed as I realize the early morning alarm clock setting – on Daylight Saving Time change! I sigh as I realize how content I am to simply be back home and not running driving anywhere more today. One of the writing resources I use with my 5th grader is Giant Write Every Day . I don’t use it every day, but it does make for nice writing prompts when I want to refresh his writing. Since I pulled out a page for him today, I thought I’d use the same prompt for today’s slice. Write five reasons for having a pet. 1. They snuggle you when you are sick. (If I’m sick, I want to just be left alone). 4. A pet fish never asks for much! 5. You can use the pet as an excuse to get out of almost any situation. Write five reasons for lettuce. 1. You can use it in place of buns on sandwiches and burgers. 2. If there wasn’t lettuce, I wouldn’t think of my brother naming a baby rabbit “Taco” because it eats lettuce. 3. Tacos are pretty bland without lettuce – or tomatoes. 4. It would be pretty hard to eat a salad without lettuce. 5. Lettuce makes any meal healthier! Write five reasons for wearing shoes. 1. My feet would get extremely cold in the winter! 2. Shoes hide my mismatched socks. 3. The lift in my shoes keeps my shorter leg balanced with the other. 4. Bare feet would look pretty silly with a fancy dress. 5. You can find so many cute options for shoes! What would you add for reasons to these lists? We rarely take a snow day. As a homeschool family, we just keep trucking along with schoolwork. Now. Before you shake your head and sigh. Let me explain what “trucking along with schoolwork” on a snow day truly means. It means the boys get to hang out with their friends – from the neighborhood and online. It means the boys’ school day gets adapted. They usually work on their core subjects. It means they get a bit of a break, and I do as well. I know these days are special. I know they work hard. I know that if we can count the day, they are one day closer to being done (usually by early May!). Today was different. As we expected 8-10 inches of snow, my oldest came up to me and said. Because I wanted a real snow day too! Every Wednesday afternoon I sit. I sit with one son for a half-hour. I sit with the other one for the next half-hour. Sometimes her dog joins us. We are used to his barking when we walk through the door. We chuckle at how he slides against the floor. One son prefers to snuggle with the dog on the floor. The other prefers to sit in a specific chair. I sit in the corner of her couch. We whisper. We share quiet laughs over games played on devices. We discuss math or grammar worksheets. I play on my phone, read a magazine, chuckle with my boys. And in the background I listen to the sounds of piano keys playing, of a teacher correcting, of a teacher encouraging, of a teacher challenging, of a teacher perfecting, of a student sharing, of a student perfecting. Every Wednesday afternoon I sit while my boys have their piano lessons. I stare at my blank screen. The words just don’t flow easily today. Do I write about what our typical Tuesdays? Do I write about how we regularly visit our chiropractor’s office? Do I write about how my boys are part of the swim team? Do I write about the homeschool history class the boys go to every other Tuesday? Some days the words flow easily. Some days they struggle to even make sense. Some days writing is just one more “to do list” item. Another Monday starts my week. Iron my husband’s dress shirt. See my husband off to work. Math and Reading Eggs for another. Listen to a recorded interview clip as I start working on a freelance story. Check the swim website for the pysch sheet. Shovel the driveway with the boys. Send the boys outside to play in the snow. Take on a pile of baseball-related paperwork. (I volunteer). Hand off a pile of paperwork to a fellow volunteer who stops by my house. And this is just a slice of my morning! 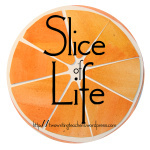 Finally, I find myself gearing up to once again blog in the Slice of Life challenge. It has been a few years since I’ve been a part of this monthly challenge. Sadly, I am not traveling to a warm spot this March, so I should have time to blog each day. At least that is the plan! What stories will I share? What insight will I have? What mundane activities will become my inspiration? Stay tuned. Both of us may be surprised at what transpires with this month of blogging. This monthly blogging challenge is through Two Writing Teachers.